Boss Rob Page says midfielder Jak McCourt is ‘progressing well’ in his recovery from a neck injury and is in with a ‘fighting chance’ of lining up for the Cobblers in Saturday’s derby date with Peterborough United at Sixfields. But JJ Hooper is a serious doubt after tweaking a thigh muscle in Saturday’s 2-1 defeat at Gillingham. The on-loan forward has returned to parent club Port Vale to undergo scans on the problem, and Page says it will be later in the week before the extent of the injury can be ascertained. McCourt missed the weekend trip to the Priestfield after he suffered a problem with his neck during the 6-0 FA Cup first round win over Harrow Borough. Scans and X-rays have revealed no serious damage, and the player is gradually being eased back into action, with Page hopeful he may be available for selection as Posh head to Sixfields. 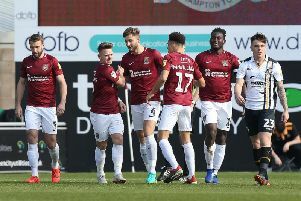 “The good news with Jak is that he is progressing really, really well, and will have a fighting chance for the weekend,” said the Cobblers boss at Tuesday morning’s press conference. “It is hard to tell what the problem is, as all the X-rays and scans were clear, and we are assuming it is nerve damage, although it could just be a muscle spasm that is affecting him. “But every day he is getting better, he is in with the boys today and he is going to do the warm-up and the first part of training which is great. The news on Hooper, who has made the place on the left of a front three his own in recent weeks, is less positive though. “JJ has tweaked his thigh, and he is back at Port Vale at the minute being assessed and is having scans,” revealed Page. There are no other injury concerns for Page, who will also see his options boosted by the return of Gaby Zakuani from international duty with DR Congo. Zakuani captained his nation to a 2-1 World Cup qualifying win over Guinea on Sunday, and is due to return to Town training on Thursday. Meanwhile, the Cobblers now know they will travel to non-League Stourbridge in the second round of the FA Cup. The Glassboys, who play in the Evo-Stik Northern League Premier Division, were 3-0 winners over National League South side Whitehawk in their first round replay on Monday night. The will entertain the Cobblers at the War Memorial Athletic Ground on Sunday, December 4, with a 2pm kick-off. Ticket details for the tie will be announced in due course.